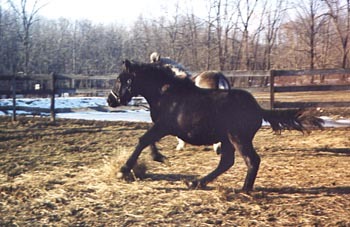 In 1998, 1999, 2000 and 2002 Mylestone participated in a rescue of ten Premarin or PMU foals from Canada. 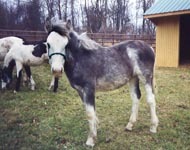 The foals were legged down thanks to the help of caring horse people, and finally reached their New Jersey destination. 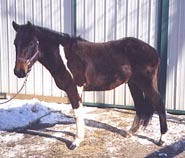 The foals all suffered from shipping fever and had to be immediately treated. 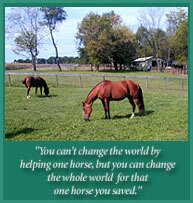 We were fortunate enough to find good homes for the foals and several have gone on to wonderful riding careers! 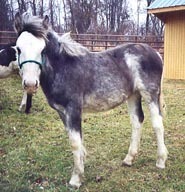 For those who are unfamiliar with the meaning of Premarin foals - they are the by-product of the drug industry which manufactures Premarin for women to relieve menopausal symptoms. Urine collected from the mares is used in the medication, but the most heinous side-effect of the process is that the unwanted foals and `no longer usable' mares are sent to slaughter for horsemeat. 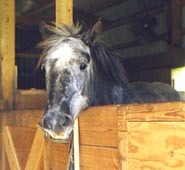 Equine rescues work to save as many of these innocent horses from slaughter as possible, despite its being an uphill battle. Pictured here are just a few of the Premarin foals Mylestone rescued - Scout, Hope, Yaz and Grace - and who now live happy, loved lives.